The Sullivan County Fair is requiring that all horses coming on the grounds during the Fair for exhibition or otherwise be vaccinated with an approved Rabies vaccine. A certificate of vaccination showing name of vaccine, identification of animal, and signature of an accredited veterinarian must be presented upon entry to the grounds. Each exhibitor is limited to two entries in classes 1 thru 10. Drivers and assistant drivers must wear suits and ties. Ladies may wear formal dress, slack suit, or long skirt and blouse. No jeans allowed in any of the classes below except classes 11 & 12. Youth age is determined by participants who have not reached their 19th birthday by the time of the show. Age of horse is determined by January 1. All youth drivers must be accompanied by an adult. Attendants for hitch classes will be allowed in the ring only at the area in front of the gate for emergencies only. No Stallions allowed in Youth Showmanship. No Scotch Collars or Patent leather show harnesses will be allowed in Farm Class. Two-wheel cart to be used in one-horse cart classes. Entry fee is $2.00 per horse. All horses shall be weighed for respective classes. Medium weight team-under 3400 lbs. Open class team-over 3400 lbs. A full distance pull shall be 16 1/2 feet and any movement of the boat by a team after the driver has given the command for the team to go shall be called a pull and each team shall be allowed three (3) tries to make a full 16 1/2 ft. pull. If after three (3) tries the team has not pulled the 16 1/2 ft., they shall not go on to the next weight. The track shall be 12 feet wide and shall so be marked. If a team steps on or crosses the line, on either side, that pull shall be disqualified and have to take his next pull in order. The team shall not be changed or replaced during a pull, or the driver. If done, that team shall not be allowed to continue the contest. Driver may, however, change sides with his horses, time permitting. Any slapping of any kind to the horse shall disqualify that pull. Behavior of all horseman (drivers and helpers alike) to be above reproach at all times or DISCIPLINARY ACTION BY THE JUDGES WILL BE TAKEN. ANYONE DISPUTING THE DECISION OF THE JUDGES WILL BE IMMEDIATELY DISQUALIFIED. The driver and no more than four (4) helpers will be allowed to any one team– with absolutely no heading! There will be a time limit of three (3) minutes from the time the announcer calls for that team to start to pull. If the team fails to start to pull in three (3) minutes, they will be disqualified and pull the next pull in order. If disqualified in the third pull, the team is out of the contest. On final pull– team must hook on either end if room for full pull or boat will be spotted in center of track. In case contestant is late, he must start pulling at present weight being pulled. Judges decision shall be final! No pony will be eligible to pull in horse pulling contest. Teams pulling in the heavy contest must have at least one fresh horse (one horse that HAS NOT pulled in the previous contest). In the event, there aren’t enough teams to fill the prize money, any NON-WINNER can return. No horses or ponies showing evidence of any contagious or infectious disease will be permitted entry to the fair. All horses to be exhibited at Pennsylvania fairs that are receiving State funds must be accompanied by a Certificate of Veterinary Inspection prepared within 30 days of the opening date of the fair by an accredited Veterinarian. The Health Certificate shall include the negative date of the Coggins test which has been conducted within twelve months of an opening date of the fair at which the horse is to be exhibited. The Sullivan County Fair is requiring that all horses coming on the grounds during the fair exhibition otherwise be vaccinated with an approved Rabies vaccine. A certificate of vaccination showing name of vaccine, identification of animal, and signature of an accredited veterinarian must be presented upon entry to the grounds. Driver and one (1) helper admitted with entry. Entry fee for teams $10.00. Drivers & Helpers will wear wristbands and are the only people allowed in pulling arena. No one else will be allowed in pulling arena. All spectators must be in the grandstand and be behind the railing. No abusive language will be tolerated from spectators and those offending will be escorted from the fairgrounds. No consumption of alcoholic beverages will be tolerated. The Fair reserves the right to have a veterinarian on the grounds and to have horses blood tested. All health rules set by the PA Department of Agriculture (page 10 in the book) will be enforced. All health rules listed in Section 2 & 3 will be enforced. Distance for a full pull will be 10 feet, 6 inches. 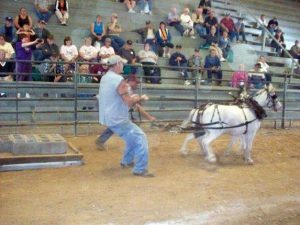 All rules in Department 2 under horse pulling will be enforced for the mini horse pulling contest.